Look high in the Southern skies (if you are in the Northern Hemisphere, look to the North if in the South) and you will see brilliant Jupiter shining brightly. 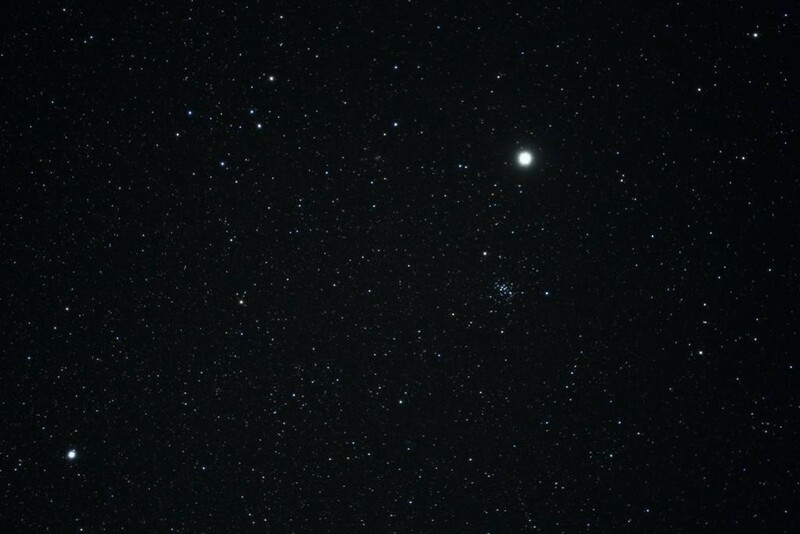 To it’s left is the 1st magnitude star Regulus, which is the heart of Leo the Lion. 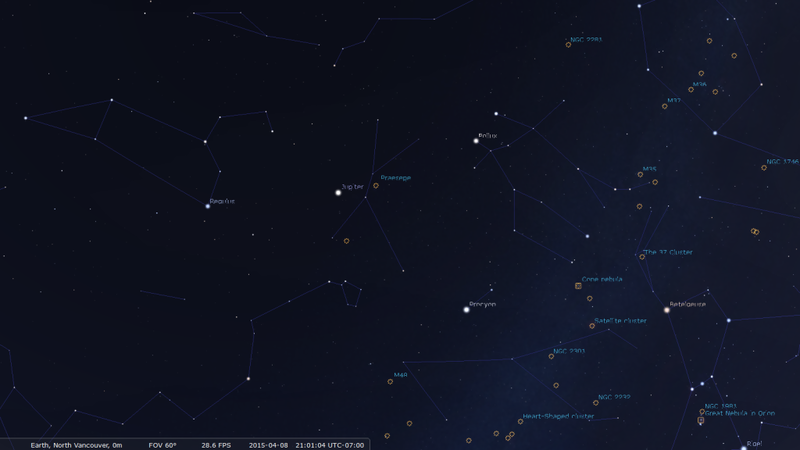 If you draw a line from Regulus, through Jupiter you will arrive at The Beehive Star Cluster, in the constellation Cancer, the Crab. 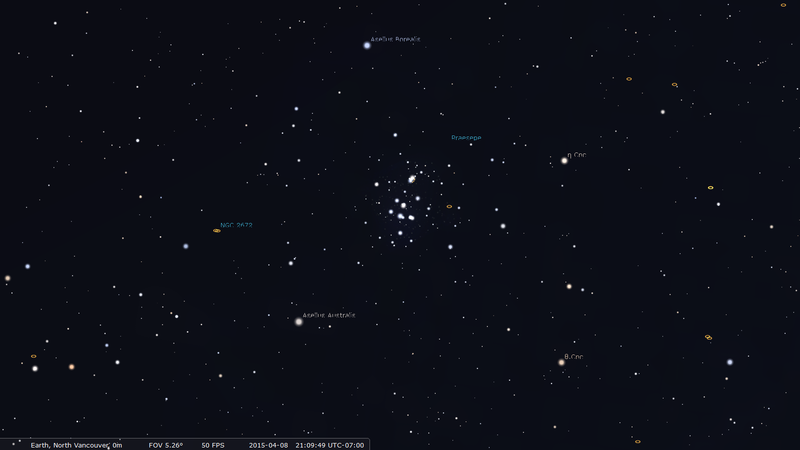 If you have decent vision, a dark, clear sky with good transparency you can see this cluster as a dim cloud. Binoculars or a small telescope however will reveal a myriad of stars of varying colors and brightnesses. A large telescope isn’t really ideal on this object, I will however take a look using a wide angle eyepiece such as a WO 40mm SWAN 2″. But binoculars are the instrument of choice. Here is a wide angle shot taken with a DSLR with a 35mm lens by Steve Coe, to give you an idea (Jupiter has moved to the East since this shot in March). Next you can swing your binoculars over to the king of the planets, Jupiter. You may be able to pick out it’s 4 brightest moons. Through a telescope is an entirely different story. You will be able to view at least some of the equatorial bands, and even greater details with larger aperture, better quality optics and eyepieces. But even a cheap telescope will offer stunning views. Patience is the key. And the longer you look, the more details that will become evident to you. Using a webcam in conjunction with a telescope for pictures of Jupiter is another fun and rewarding project, but we will delve into that at another time.